Crusaders midfielder Philip Lowry was a happy and relieved man after their final day title win. 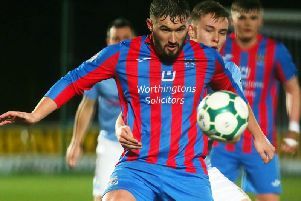 The Limavady man, who scored the all important equaliser at Ballymena United, knew a lot of his friends were cheering on Coleraine in Saturday's Danske Bank Premiership finale, but he was happy to be going home with another winners medal. The talented midfielder in recent weeks has played a major role in the Shore Road men's run-in. Crusaders midfielder Philip Lowry celebrates scoring their equaliser at the Ballymena Showgrounds.